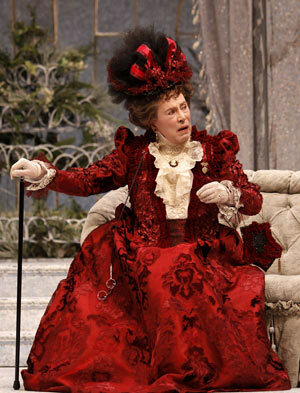 Brian Bedford in The Importance of Being Earnest on Broadway. Photo by David Hou. I actually scrawled “Really? Really?” on this page when I read it. Because wow, EW really must not see much theater. Very rarely have I seen Lady Bracknell NOT played by a man. It’s not necessarily the default — there are still plenty of productions out there where she’s played by a woman — but it’s probably the most popular drag role that wasn’t necessarily written as one, and has been for decades. He may well be hilarious, and the drag choice may be a draw, but come on, it’s not like it’s particularly innovative.